And so, after a year and a half of work over 4 productions and 2 casts, tonight it finally comes to an end. We've done this show for sold out houses, and audiences of 4. We braved the wilds of Hamilton, and Toronto's east side. 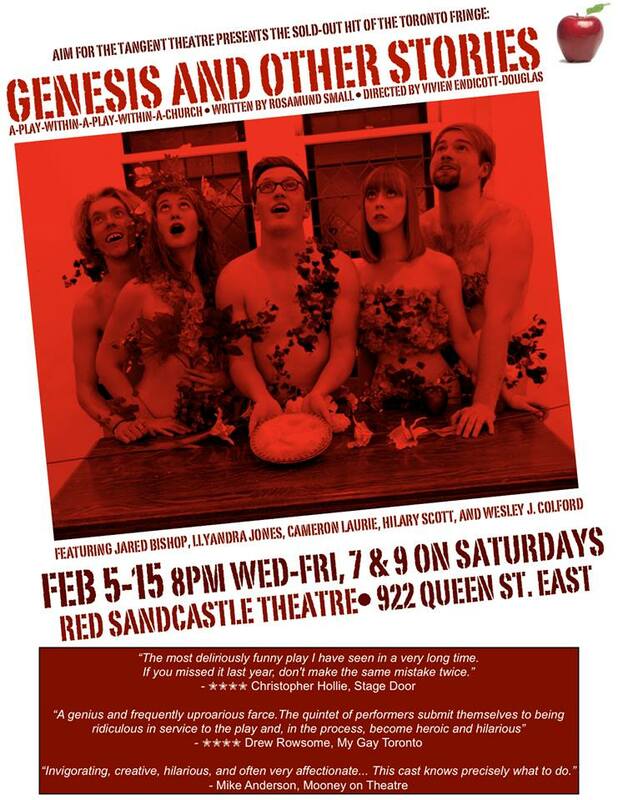 We've played churches, cathedrals, and chapels - not to mention Red Sandcastles - and at 10:00 tonight, Genesis will go back into whatever vaults store the unlimited creative potential that is theatrical magic. It's unfortunate that said magic is transient, and wholly dependent on it's inconstant, ethereal nature, but then if it was constant... would it truly be magic? And so like the Sandcastle within which we've made our home for the past two weeks, at the end of the night we go out with the tide. Thank you to everyone who's made this play such an enormous part of my life. To Ros, for creating the most fun world to play in and letting us continue to play in it. To Viv, for shaping and believing in that world, and charging gung ho along with my crazy schemes. To all the actors I've had the privilege of sharing the stage with and the many voices who have brought this play to life in so many different ways. To Lee Fairbanks and the Pearl Company, for believing in us. To Rosemary Doyle, for her wisdom, trust, and generosity. And to all the people who laughed: Truly we are a blessed troupe. And for all the people still to laugh: See you tonight. "The most deliriously funny play I have seen in a very long time. [Rosamund Small] scores more laughs in only 75 minutes than do many comedies in twice that time... If you missed it last year, don't make the same mistake twice." "A genius and frequently uproarious farce...The quintet of performers submit themselves to being ridiculous in service to the play and, in the process, become heroic and hilarious." "Invigorating, creative, hilarious, and often very affectionate... This cast knows precisely what to do."